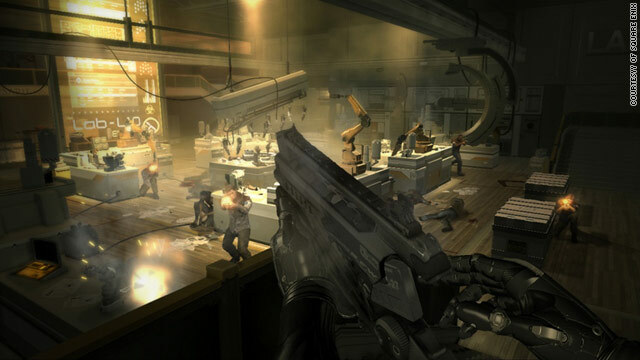 In "Deus Ex: Human Revolution," players must use biomechanical implants to gain superhuman abilities. Editor's note: Scott Steinberg is the head of technology and video game consulting firm TechSavvy Global as well as the founder of GameExec magazine and Game Industry TV. The creator and host of online video series Game Theory, he frequently appears as an on-air technology analyst for ABC, CBS, NBC, Fox and CNN. (CNN) -- Summer is typically a slow time for video games as fans ditch their controllers in favor of sunny seaside vacations or the pleasures of the great outdoors. But this year, a number of high-profile new releases hope to buck that trend. From the return of notable gaming franchises ("inFamous 2," "Dungeon Siege III") to the debut of much-anticipated sequels ("F.E.A.R. III," "Super Street Fighter IV: Arcade Edition"), expect no shortage of surprises this season. Better still, a sizable stack of new PC, console, mobile and online amusements, including the weird ("Catherine"), wild ("UFC Personal Trainer") and outright bizarre ("Michael Phelps: Push the Limit"), are just the beginning. Players may also get the chance to discover Nintendo's next Wii video game system, rumored to be packing high-definition graphics, more power than the PlayStation 3 and a touchscreen controller, in June at industry trade show Electronic Entertainment Expo 2011. Against all odds, fabled "vaporware" title "Duke Nukem: Forever," in development for more than 14 years and gaming's equivalent of Guns N' Roses' legendarily delayed "Chinese Democracy" album, may actually ship -- and by fall, no less. Between an unexpected comeback for old-school spaceship shooters ("Otomedius Excellent"), the rise of retro-inspired role-playing games ("Hunted: Demon's Forge") and three-dimensional updates of classic fighting series ("Dead or Alive: Dimensions"), bombshells abound. Alice: Madness Returns (Electronic Arts, PC/PlayStation 3/Xbox 360) -- A twisted take on Lewis Carroll's "Alice's Adventures in Wonderland" story. Expect a wealth of offbeat puzzles and psychedelic landscapes to explore from this sequel to the critically acclaimed 2000 original. Picking up after the first title ended, Alice (here a mentally disturbed girl whose psychological troubles have created a warped and gonzo netherworld) must fight off quirky enemies while wandering through the surreal alternate reality. Armed with teapot cannons, hobby horses and wicked-looking knives, familiar faces, including the Mad Hatter and Cheshire Cat, make cameos as you tour a tortured world of warped childhood fantasies and inexplicable chessboard imagery. Child of Eden (UbiSoft, PlayStation 3/Xbox 360) -- The music-and-rhythm game genre's viability has been called into question lately, given MTV's sale of the "Rock Band" franchise and Activision's recent benching of the popular "Guitar Hero" series. But this interactive laser light show, a motion-sensing shooter where you blast scintillating shapes by waving your hand to create musical tones dynamically, hopes to prove there's life in the genre outside of "Just Dance." A spiritual sequel to cult classic "Rez" that's designed by renowned game maker Tetsuya Mizuguchi ("Lumines"), its kaleidoscopic effects and space-age soundscapes make it as much a club night warm-up as actual digital diversion. The Legend of Zelda: Ocarina of Time 3D (Nintendo, Nintendo 3DS) -- Hailed as a masterpiece of early 3-D game design, the fantasy role-playing classic has been updated to include 3-D special effects that appear literally to burst from your Nintendo 3DS system's screen. If any title can help turn around the glasses-free handheld portable system's underperforming sales, it's this enhancement of the timeless 1998 Nintendo 64 smash, renowned for its sophisticated gameplay, storyline and challenges. In addition to the original game and more-difficult Master Quest, which offers differing dungeon layouts and puzzles to enjoy, freshly added touch controls should make the experience more accessible to newcomers. NCAA Football 2012 (EA Sports, PlayStation3/Xbox 360) -- As the virtual collegiate gridiron's perennial Heisman Trophy winner by default (being the only game in town), the reigning champ of university-level football simulations doesn't always deliver an MVP performance. Although it's more a new iteration than true innovation, this year's edition, we expect, should go the distance with improved collision detection for more accurate tackles and striking visual upgrades, including better lighting, 3-D grass (no, seriously) and more lifelike players. Aiming to improve the game's overall pacing and fluidity while also adding high-tech replicas of authentic school game-day traditions such as Georgia Tech's Ramblin' Wreck (Google it), here's hoping it's a game-winning effort. Deus Ex: Human Revolution (Square-Enix, PC/PlayStation 3/Xbox 360) -- "Blade Runner" fans would do well to check out this open-ended, sci-fi role-player, the latest in a best-selling series praised for the sheer freedom of choice it offers fans. Set in a bleak, futuristic Renaissance world with an equally gritty and atmospheric storyline, players must use biomechanical implants to gain superhuman abilities that make sneaking past or splattering enemies simpler. A mature global conspiracy thriller, it doesn't pull punches, letting you attack scenarios using many tactics from stealth to combat, hacking or puzzle-solving, ensuring that the title never plays the same way twice.